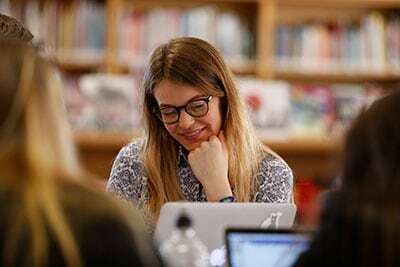 Sixth Form students are given expert help and advice on university applications and personal statements from the Deputy Head, the Head of Sixth Form and the Sixth Form tutors. The School hosts a ‘UCAS Day’ and a Higher Education Conference. In addition, all Sixth Form students attend a UCAS Convention in Year 13 and a Post 18 Higher Education and Apprenticeship Fair in Year 12. Interested students attend the annual Oxbridge Conference. To assist with course selection, Year 12 students complete an online questionnaire called Centigrade, which matches students’ interests and abilities to degree, foundation degree, HND or Diploma Higher Education courses. Students complete the Spartan and Stamford tests to identify their skills, attributes and interests further. Year 12 students undertake a week’s Work Experience placement in the Summer Term, followed by a feedback session, including student presentations and undergo formal business interviews arranged by ‘BEES’. There is a comprehensive mock interview programme, which involves verbal and written feedback. Mock interviews match the style of interview they are going to experience e.g. Multi-Mini Interview, stimulus, panel and group and high level applicants are mentored.